Lords of the Sith by Paul S. Kemp has the distinction of being both a book that’s what it says on the label and of also being filled with unexpected surprises. 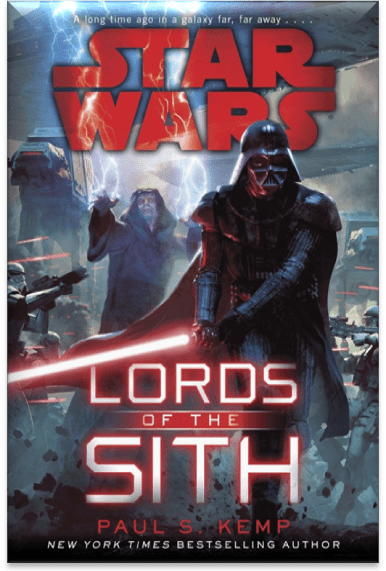 Out today in bookstores everywhere, Lords of the Sith successfully gives you your fix of Vader and Palpatine being ruthlessly effective when it comes to taking care of business while telling all sides of the story. Vader getting a story in which he gets to be the badass supreme can often be impressive enough but when you add in Palpatine also getting his hands dirty? You know it’s going down. Part of what makes the Emperor such an effective character is how rarely he actually dives in to the fray himself. Readers and watchers know that someone’s going to die the minute the lightsaber (or the Force lightning) come out. Not many people have lived to see this brutal efficiency and for good reason.